Take the vicious herdsmen out, and it was the greatest daytime battle for the soul of Plateau since its creation in 1976. The ground was the Rwang Pam Stadium right in the heart of Jos. To prepare for this epic battle, Governor Lalong laid and supervised elaborate plans to mesmerize and completely dazzle his visiting newfound godfather and helper, President Buhari. This is the man Governor Lalong has declared he would gladly die for. Primary school teachers were told that part of their duties now included giving support publicly to the president. Local government workers were likewise coerced to join the queue. Vehicles were dispatched to all the over three hundred electoral wards in Plateau. Political office holders were ordered out of their offices to go to their local areas and mobilise the people. Not yet done, human contractors were dispatched to neighbouring Bauchi, Kaduna, Niger and Nasarawa States as well as the federal capital to rent and ferry people to Jos. They brought in mostly children and teenagers. But they had enough supply of thugs. Some people were offered three thousand Naira each to come and spend the day with the president. The Jos Metropolitan Development Board worked tenaciously on the government order to remove any and every sign of opposition on public facilities. Some billboards were uprooted, some replanted far away from good public view and the rest were either broken or defaced. Opposition figures were no longer Plateau indigenes. Lalong alone is! The ruling party was on mission to forcefully bury other parties even if they were not yet certified dead. In the meantime, Governor Lalong's pictures sprang up on every electricity pole and roundabout. The APC Chairman, the state commissioner of Information, who appears to be both party spokesperson and the governor's special executive assistant as well as one recent political convert all boasted that Plateau was APC’s and they would confirm it on D-day. Aah, they also boasted to hand over to the president their new haul a special cache of new political proselytes. Soldiers deployed and over-deployed. You would think Shekau was spotted in Jos. Police deployed heavily. Civil defence. Vigilante group. And nearly everyone who could be persuaded to join the drama. *The goal:* capture the Plateau spirit – and celebrate it nationwide. Many people played safe and stayed away from the presidential route. They reasoned that from past records, Buhari's visit would always raise tension, incitement to violence and disorderliness. But long after the programme should have covered reasonable ground, word filtered out that all was not well with the rally. APC could not bring order to bear on its strange hired hands and faces. Very typical of an APC crowd! They were hired to cause mayhem in Mangu just after the PDP governorship flag off on January 8. But they could cause only little intimation. 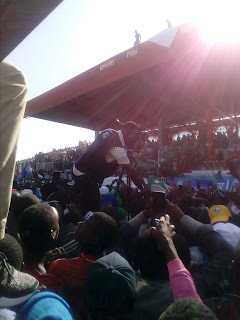 They came again to the PDP presidential rally at the Polo field on January 12. But the peaceful crowd overwhelmed them. They finally ended up at their Master’s programme in the stadium. And what a prize to pay to rent a crowd! It is now evident to all that Governor Lalong and his party have indeed lost the battle for the soul of Plateau. His visitors had to beat a hasty retreat out of town. Governor Lalong has wired himself to fail. He had since disconnected himself from the people who gave him the mandate in the first place and had been hanging on the shoulders of PMB to get a second term. Now he knows the reality: even PMB had to be rescued from the crowd. And PMB had no words absolutely to tell anyone in Plateau to vote for Lalong. He went back to Abuja silently . . .so silently that he also failed to show up at the presidential debate! It is certain that the Governor will soon fly to Abuja to thank the president for this visit and how much Buhari had blessed Plateau these three years seven months. But everyone will remember that PMB did not raise Lalong's hand at the stadium; PMB did not say anything in support of Lalong's second term campaign; PMB did not receive any decampees; PMB did not commission any projects. PMB knows only that he has no votes enough to win Plateau in the February16 election. So then, this is the summary: APC, Lalong, face your Plateau. It is the people you have turned against that will consign you to a disappointing political history. 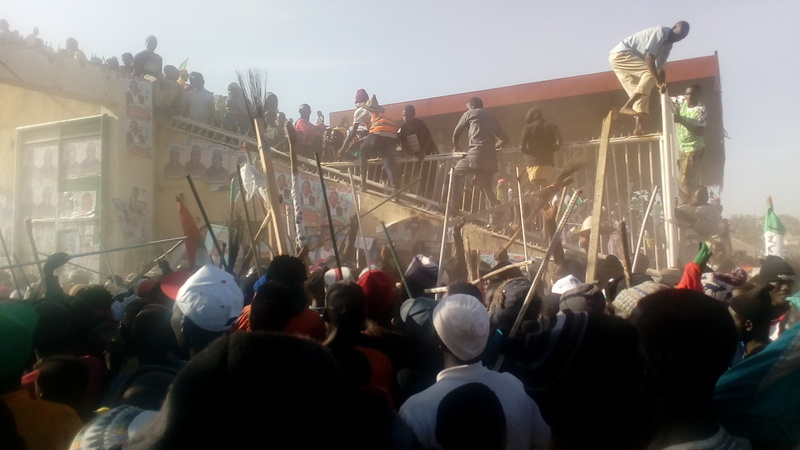 This ill-fated rally is the greatest disservice to the honour and dignity of the Plateau person. And with scarce resources needed for alleviating the traumatic condition of the people, this presidential outing in Jos has been the most wasteful expenditure of public funds! Lalong is Lalong's undoing. Period! Plateau will not give him life so that he dies for some other person and not for their welfare. All Plateau must rise and *Restore* the dignity of this beautiful and fully blessed State.